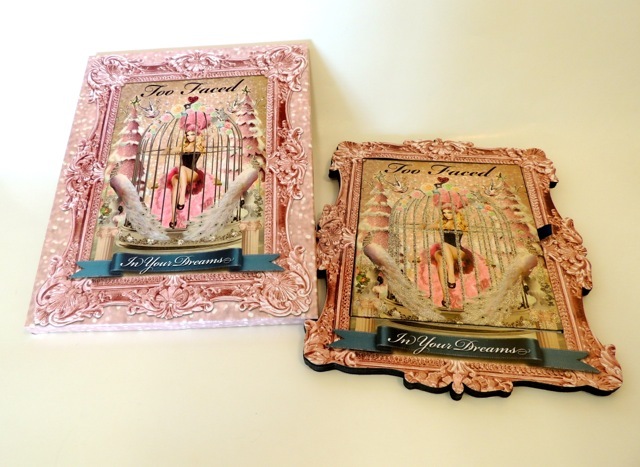 TOO FACED In Your Dreams - Give Me Gorgeous! Fancy, is how I’d best describe this palette. It’s a little too unwieldy to pack for use during a trip or at the gym, but it is a very nice collection of colors. The whole palette is fairly thin – just under a centimeter thick. The lid has a ribbon tab pull that makes it easy to open and magnetic inner corners give it a tight closure. Contained within are nine eye shadows (ea. 1 g or 0.03 oz), three blushes (ea. 4.3 g or 0.15 oz) and three lip glosses (ea. 0.8 g or 0.02 oz). The outer corners of the palette measure about just over 7″ by 9.5″. The makeup colors come in three color schematics to be worn together, to create three different looks: Natural Beauty, Feminine Flirty and Seductively Smokey. Each set comes with one light eyeshadow, a medium eyeshadow and a dark eyeshadow. I bought this some time last year because I liked all of the color collections and thought the variety would give me more colors to experiment with and try. The most worn of the eye shadows, for me, have been Silk Stockings (cream), La Cage & Swing (medium browns) and Dream On (the purple). These wear best with a primer. 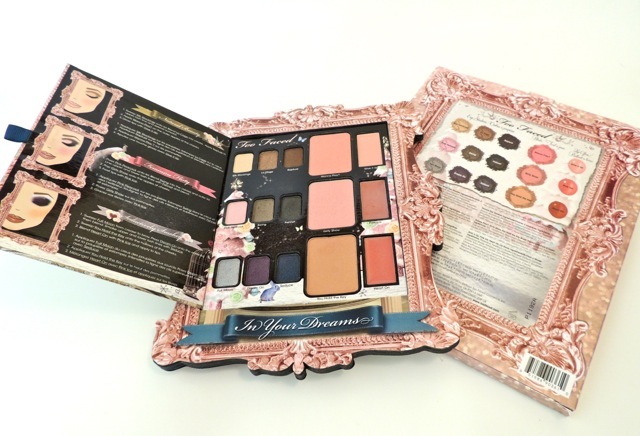 Although I think Too Faced no longer carries this specific palette, they do tend to always have a variety of palettes with thoughtful selections.